Do you have lots of instagram followers? Have you ever realized that how they come to know when you are active on Instagram? Sometimes it becomes difficult to handle the situation when you get messages from several of your instagram followers that you’re not actually familiar with. The best way to deal with such situation is to hide your activity status. 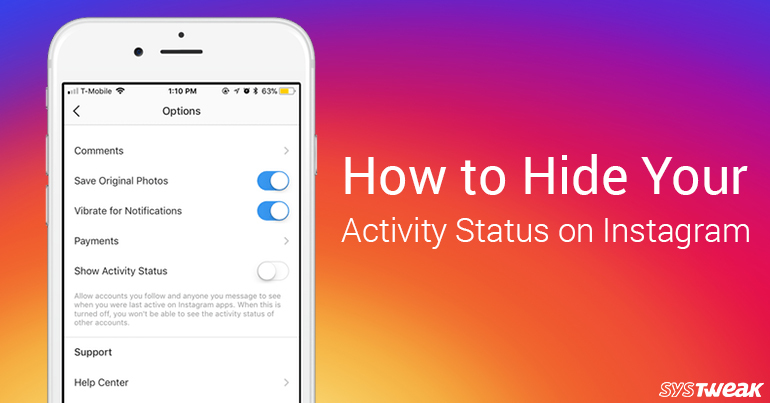 So let us find out how to hide Activity Status on instagram and if you follow your crush on instagram then here is how you can see when he or she was last active. It is very simple to check last active on instagram but for this you would have sent a message or replied on the story of the person. On the home screen of instagram app tap on direct icon given at the top right along with the list of people you have sent messages you will see the time when they were active. How to hide your last Activity Status On Instagram. To hide your last activity status Open instagram app on your Smartphone and tap on your profile icon given at the bottom right. You will see your followers, People you are following your and posts. If you are an iPhone user now you will see settings button given to the right of edit profile button tap on it. If you have an Android phone than on the top right you will find options button (three dots). Tap on it to reveal options. Scroll down you will see Show Activity status switch Toggle it off and come back to the home screen of instagram by tapping on home button. That is all, now your followers will not be able to see when you last active on instagram. Here you should know that you will also be not able to see last activity status of people. I think this is because instagram what to keep it same as whatsapp or Facebook where when you hide your last seen or activity status you will not be able to see it for others. So, post chat or follow people on instagram and others will not know when you were last active.